Gosnay, Nord pas de Calais, France. The majority of this striking building seemingly dates from the 18th century, but the place has a heritage which runs far, far deeper. Indeed, the origins of what is today a celebrated hotel are reputed to lie in the early 1300’s when it was home to Carthusian monks. During its time as a monastic community the property attracted a fair few notables, including Philipe Le Bon, Charles la Temeraire (“Charles the Bold”) and his mother Isabelle of Portugal. 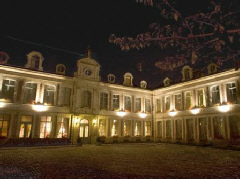 La Chartreuse du Val Saint Esprit is also reputed to have a connection to Mahaut, Countess of Artois, after whose father, Robert II of Artois, the hotel’s restaurant is named. Its 66 guest bedrooms include family rooms and suites. Bethune is but a short drive away, while Arras and Lens are also within easy reach. Access to the ferry port at Calais is via the nearby A26.